Black Forest Cake 2 is chocolate sponge with sour cherries jam layers. Black Forest Cake-2 is chocolate sponge in this cake is soft with sour cherries jam layers 1.5 pound - Servings 6 persons. Special recipe from Cake 2 Thailand ® Presented in a beautiful gift box. Sure to be impressed. Free delivery in Bangkok and surrounding area. Same day delivery now available. Place your order by 6pm. (US Time Zone) or 12pm. (UK Time Zone). Your cake will be delivered the same day or within 3-4 hours. Substitution may be applied. - Decorations may vary from the picture depending on availability and season. 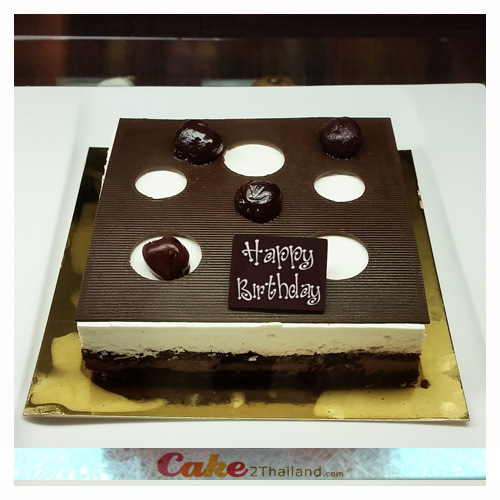 All cakes shown on the website only deliver in Bangkok areas. The cakes for other cities in Thailand will be made and delivered by local bakeries. The design and decoration would not be the same. Cakes are subject to availability.